NIOSH aims to develop new knowledge, evaluate potential benefits and risks of robots in the workplace, conduct workplace interventions to prevent robot-related worker injuries, and develop guidance for safe interactions between humans and robots. Disaster cleanup work is extremely hazardous. According to a nationwide network of workplace health and safety groups, more recovery workers could die from the cleaning up after hurricanes Harvey and Irma than were killed by the storms. After a catastrophic flood and during the cleanup, disaster recovery workers need to protect themselves from life-threatening infectious organisms and toxins that the contaminated floodwaters have left behind on everything. The New York City Council, on Sept. 27, adopted a new municipal construction safety law – requiring all construction workers on building projects of five stories or higher – to have mandated construction safety training. Wildfires and severe smoke can create dangerous conditions for not only firefighters, but also for the public. Because of the increased risk of exposure to wildfire smoke, Cal/OSHA has issued special guidance on the special precautions to protect people and workers from the hazards from wildfire smoke. Miami-Dade County in Florida has established important OSHA safety training requirements for county construction contracts. OSHA Training is required for all construction employees on any Miami-Dade County public or private contract valued in excess of $1,000,000. OSHA is investigating a workplace accident at an Amazon facility on Sept. 19 in Cumberland County, Pa. which claimed the life of one man in which he was run over while helping the driver of a truck tractor hook up a trailer. OSHA announced the preliminary Top 10 most frequently cited workplace safety violations for fiscal year 2017. Fall Protection still tops the list at No. 1 – with Hazard Communication at 2; Scaffolding at 3; Respiratory Protection at 4; and Lockout/Tagout at 5. Embracing safety and health as a cornerstone of sustainability is good for workers and good for business. The NIOSH Worker Health Charts (WNC) tool allows you to create charts to examine U.S. workplace safety and health issues. Welcome to OSHA Training Campus - a leading provider in training and education in occupational safety and health for federal and state compliance officers, state consultants, other federal agency personnel, and the private sector. 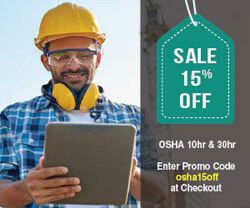 We offer the most convenient OSHA-accepted online OSHA training courses - like OSHA 10-hour and 30-hour in Construction or the General Industry to get you into a job. OSHA Training key terms: osha training,osha safety training,osha outreach,osha outreach training, osha online,dol card,osha card,10hour,10hr,30hr,30 hours,osha accepted,osha training program,osha construction training.